An osprey was admitted in early September to the clinic with a broken right humerus(a bone located in the upper section of the wing). It was found on the ground in a cemetery in Salem, MA. On initial exam, the fracture was stabilized with a wing wrap and the bird was given pain medication and fluids. The osprey then underwent a surgical procedure to repair the wing. A pin was surgically placed in the wing to stabilize the fracture and allow it to heal over time. Over the next few weeks, the fracture was monitored and is healing well. 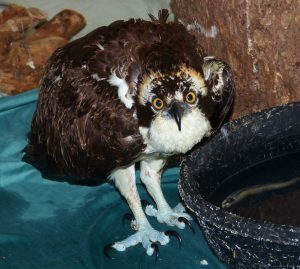 The osprey is currently still on pain medication, and the fracture site continues to progress well. We will hopefully move the bird to an outdoor enclosure soon to start reconditioning the wing for flight. The osprey is the only hawk on the continent that eats almost exclusively live fish and they are distinctive among North American raptors for its ability to dive into water to catch them. Osprey are commonly seen soaring over shorelines, patrolling waterways, and standing on their huge stick nests. Most osprey that breed in North America migrate to Central and South America for the winter, but some will overwinter in southernmost United States.